For a large waterfall with big sound: The RapidFlo™ Ecosystem Pond Kit is ideal for those who want a large waterfall or stream, lots of sound to drown out nearby noise, and a system with the capacity to deal with heavy debris from nearby trees. For fish lovers: The AllClear™ Ecosystem Pond Kit is designed for hobbyists who want their pond to be all about their fish, not a waterfall. It works well in yards with full sun exposure and few falling leaves. Maybe you’ve entertained the idea of constructing a water garden in your yard, but feel you are not quite up to the task. Perhaps you are one of those people who don’t understand what all of the “hype” is about when it comes to back yard waterfalls and pricey Koi. To those of you who have yet to experience the triumphs and challenges of owning your very own water garden, there really is more to pond ownership than fish, water, and rocks. Thanks to the progression of the pond industry, both the process of selecting an appropriate type of water feature and the installation procedures associated with each style have been dramatically simplified. This broadens your selection to a wide range of water features from small pre-formed ponds for beginners, low maintenance and space saving Pondless Waterfalls, or large water gardens equipped with intricate streams and waterfalls for those of you with more experience or are daring. You can also take advantage of the cost savings of purchasing a complete Pond Kit which can save you the time and trouble of trying to purchase each component independently. Regardless of which type of pond you decide is best for you, remember to take your time and do your Homework. Being prepared will ensure that the entire pond process from design to finished product is an enjoyable experience. When done properly, a water feature can become an outdoor retreat, providing soothing sounds and sights to create a calm and relaxed atmosphere. Your water feature will accent your home and the surrounding landscape creating an inviting appearance and an increased curb appeal. Implementing Aquatic Plants and Koi into your water feature is a great way to further increase its value. 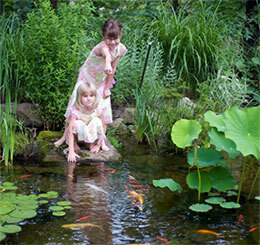 Having fish present in your water feature creates fun activities that you can do with friends and family. Witnessing a few fish antics alone provides a great source of entertainment, while feeding your fish is an excellent group activity that can create a little extra “together” time with friends and family. If you have children it is also a great way to teach them about the responsibilities of pet ownership. Every person has their own unique story about how their water feature came to exist. For some it may just seem like a logical step and for others it starts with the gift of one small goldfish. Intentional or not, it is easy to fall in love with your water feature. While there is some time and expense associated with any water feature, it all seems trivial once you see the results of such a rewarding investment. POND TALK: How has your water garden changed your lifestyle? Why its so special to have your own decorative water garden. The peaceful sound of flowing water: There’s nothing like the whisper of water down a stream or pondless water feature, the gentle splash from fountain spray or spitter, or thunder of water flowing over a waterfall. Moving water masks road noise and gives you the sense of privacy, whether you’re in an urban courtyard or a suburban neighborhood. An investment in your home: Given the current economy, many of us today are trading vacations for “staycations,” and we’re looking at ways to build on our biggest investment, our homes. Landscaping with decorative water features and creating functional outdoor living areas adds value to a home. Plus, it’s fun to add personalized décor, like stone frog spitters, turtle statues and Japanese towers, to turn the space into your own oasis. A wildlife magnet: Other living things are drawn toward water. Wild birds, dragonflies, turtles, squirrels, butterflies, and frogs will congregate around your pond. In fact, if you provide water, food and shelter for critters, you can create a wildlife habitat in your yard that will both entertain and build into the overall ecosystem. Cheaper than therapy: More than one decorative pond owner has told us about how therapeutic their water features are! After a long day at the office, there’s nothing more relaxing than sitting alongside your pond with a cold drink in hand, feeding the koi and pond fish, or appreciating the water lilies in bloom. Of course, these examples only scratch the surface of the benefits that a decorative pond or water feature can bring to your yard. You don’t have to start out with a big in-ground pond; you can begin with a simple plug-and-play water feature on your deck or patio. But once you hear the sound of the water, see the wildlife it brings and feel your stress melt away, you’ll be hooked! POND TALK: What’s your favorite thing about your decorative pond or water garden?